Radac Stungnthumz is an undead Dwemer weaponsmith who can be found in Bamz-Amschend, Radac's Forge. He is quite light-hearted, disdainful of Daedra, and will help you enchant Trueflame. Greeting — What're you doing down here? Leave an old spirit to his haunts. 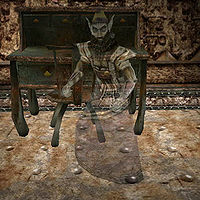 Topic: "talk to a Dwemer" — You want to talk to a Dwemer mystic? Ha! Look, I'm no mystic. Wasn't when I was alive, either. I'm a soldier, kid, plain and simple. Sure, I made weapons for my troops. No secret there. I'm no mystic, though. But you say you want to add fire to that blade? Topic: "add fire" — Well, if that's all you want to do...! You don't need a mystic, whelp. I can take care of that for you. We'll need some Pyroil Tar, though. Used to have some around here...but that was a long time ago. You can find it in the lower caves of Norenen-dur, in the Citadel of Myn Dhrur. It's an old ruin far beneath Bamz-Amschend. I swear, no one is happy with a simple blade that cleaves bone...always need the special effects. Topic: "Myn Dhrur" — Deep, deep caves. An old Daedric ruin. Fool Dunmer...worshipping those beasts. I say kill 'em all! Used to be a good spot for all sorts of resources, though. Of course, that was when there were any of us left who needed them! You can find the place through a cave-in at the Passage of the Walker. Take care down there, youngster. No telling what you may run into. You might discover a new way to die. That'd be something, at least. You should be able to find some Pyroil Tar, though. Bring that back to me. Topic: "Pyroil Tar" — Just a little something to apply to that blade of yours. Fine looking blade, by the way. Should give you that "fiery blade" effect that everyone has always been so fond of. Topic: "Pyroil Tar" — Well, you've got the tar, but where's the blade? I could just apply it to your hands, but I figure you'd cause yourself some serious injury. Get the damn blade, you daft child! Greeting — You find that Pyroil Tar yet? Topic: "add fire" — We'll do that when you bring me the Pyroil Tar. What exactly are you failing to understand? Oh...I see. If your god had wanted you to have that Pyroil Tar, she'd have miracled it over here! Topic: "Myn Dhrur" — Nasty place, that. Topic: "Pyroil Tar" — Ah...that's the stuff. Here, I'll do this. There. There's your sword. Not a bad looking blade, actually. Good luck to you, youngster. Now leave this old dwarf alone. Go! Greeting — You've got your shiny blade. Now leave an old spirit to his haunts! Topic: "add fire" — We've done that already. Pay attention! Topic: "Pyroil Tar" — I've used the tar on the blade, you moron! What do they teach you kids nowadays??? See if you can follow these instructions: Turn around. Place left foot forward. Place right foot forward. Now repeat these steps until you're out of my damn sight! This page was last modified on 24 November 2018, at 00:39.